Aloha Cluster Pays Slot is a NetEnt online slot that’s named after one of the most commonly recognised words in the Hawaiian dictionary that’s used to say hello or goodbye to someone. This upbeat slot offers you a little piece of paradise on the sun-drenched island of Hawaii, where the ancient Tiki gods are waiting to shower you with wins. The game, whose full title is Aloha Cluster Pays – includes Free Spins with Symbol Drops, Sticky Win Re-Spins, and the exciting Cluster Pays pay structure. 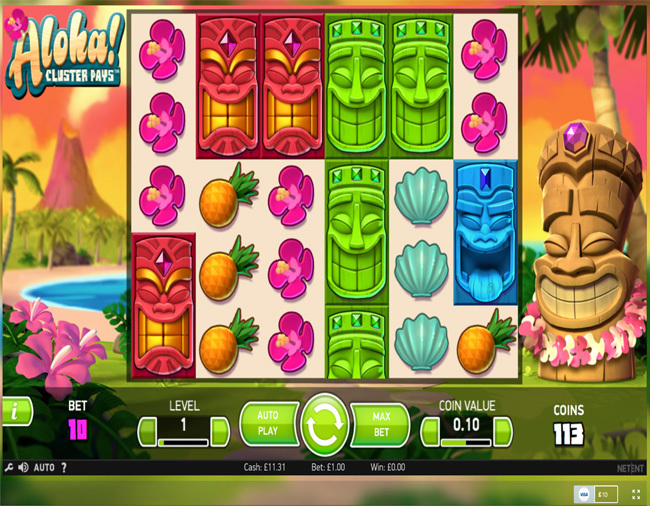 Aloha differs from the majority of online slot games in that it has six reels rather than five. Normal paylines are thrown out of the window, as the Cluster Pays Feature allows you to create winning combos anywhere on the reels whenever nine or more of the same symbol appears in a cluster (N.B., a symbol forms part of a cluster if it’s vertically or horizontally adjacent to the same type of symbol). The slot allows for bets of between 10p and £200 per spin, and the RTP (Expected Return to Player Rate) is 96.42%. As well as being able to set the Coin Value between 0.01 and 2.00, you can also choose a Bet Level from 1 to 10. In addition, the game includes an Auto Play facility, which lets you play hands-free for a pre-determined number of spins. The graphics and sound effects of Aloha really make you feel like you’re on holiday on the popular tropical island. In the background, there’s a volcano gently wafting white smoke into the air, and in the foreground, there’s an azure blue pool surrounded by palm trees and exotic flowers while a carved statue of a grinning Tiki god sits smiling on the right-hand side. The cheerful and laidback Hawaiian music soothes all your cares away while you concentrate on enjoying the game. There are nine paytable symbols which include a question mark, a postage stamp, three Tiki masks (green, blue, and red), clam shells, orchids, coconuts, and pineapples. The Question Mark is the wild symbol, and it can substitute for all symbols except the Postage Stamp. The Postage Stamp is the scatter symbol and it unlocks the Free Spins Feature when it appears three or more times on the same spin. Depending on how many scatters trigger the feature, you get at least nine free games and as many as twelve. Plus, you can gain further free games with additional scatters. The Free Spins Bonus also makes use of the Symbol Drop mechanic, which removes low-value symbols to allow for bigger wins. The Sticky Win Re-Spins Feature of the Aloha slot can be randomly activated following a cluster win. It holds all winning symbols while re-spinning the remaining symbols, and if a bigger cluster win is created, you get a further re-spin.